About this Spot: Bella Thorne wore the light pink, no sequined version of this Sherri Hill Gown to her Quinceanera on October 20th, 2012. NOTE: Bella wore the no sequin version of this gown. The pictures of that version have not been released, and will be in Nov.
Coming soon to Sherrihill.com NOTE: There are two versions of this gown, one has embellishments at the top of the gown, while one only has embellishments on the tulle. From the Spring 20131 Sherri Hill collection. Silky blazer cut in a draped silhouette. Constructed with an open front and cuffed 3/4 sleeves. Faux flap pockets; lightly padded shoulders. Allover striping. Pieced back. 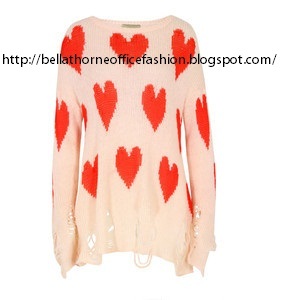 About this Spot: Bella Thorne was spotted wearing this Wildfox Love Sweater when she and her boyfriend stopped by a Pumpkin Patch in LA on October 15th, 2012. Show off your wild side in this lightweight tee featuring wolf graphic across the front. Short sleeves with vents. Measures approximately 20.5" from shoulder to hem. SINGER22 model is 5'10" and wearing a XS. 50% Cotton, 50% Polyester. Made In the USA. 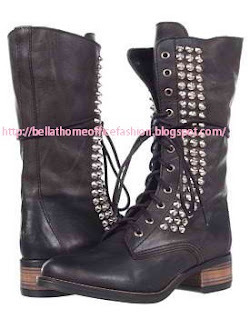 About this Spot: Bella Thorne wore these Steve Madden Boots in the Shake It Up Season 3 Promo Photoshoot. About this Spot: Bella Thorne wore these Vera Wang Mena Boots while arriving at the restaurant in which she celebrated her 15th Birthday. A blocky, square heel boosts a layered leather boot, paneled for architectural impact and alternate, fold-over cool. Approx. heel height: 4 1/4" with 1/2" platform. Approx. boot shaft height: 15"; 14 1/4" calf circumference. Leather upper, lining and sole. By Vera Wang Footwear; imported. Salon Shoes.